Learn to create a Gantt Chart in Excel following the steps I laid out in the above video. In case your tool of choice is Excel, check out my other video on how to create a Gantt Chart in Excel. Your inner project manager will thank you! If you’re interested in Business Intelligence & Tableau subscribe and check out my videos either here on this site or on my Youtube channel. You will be smarter for it! I recently finished the “Creating Dashboards and Storytelling with Tableau” course on Coursera. The course was taught by adjunct faculty at the University of California Davis. Although it is the fourth course of five in the “Data Visualization with Tableau” specialization, it is only the third course that I have taken. I skipped the very basic first course and will concentrate next on finishing the capstone. If you do take this course be prepared to put in a fair amount of work on weeks three and four when the dashboard and story project are respectively due. I put in at least five hours of effort on each individual assignment not including watching videos, reading materials and taking quizzes. I found the storytelling course to be informative and worthwhile. Unlike a Udemy course on Tableau that wades right into the applied aspects of clicking and dragging items, Coursera courses offer more of an academic background on the subject matter. The point of this course is to hammer home that stories provide context and meaning that can’t be matched by a list of facts. We’re informed that stories engage more of your brain than simply absorbing a list of facts. We learn that you should always try to make your stories relatable to the viewer so that they personally connect or identify with some aspect of the story. You should find a specific story of a person who exemplifies the larger narrative rather than starting with a lot of general facts and figures. Politicians employ this tactic all of the time. Instead of spouting off a list of facts about their particular issue, the politician will first paint a picture regarding Joe the small businessman or Jill the single mom. They’ll then discuss how legislation (or lack thereof) will affect their constituents particular situations; in the hope that the listener will relate to the individuals. This is an exercise in using the particular to illuminate the general. By all means check out my submission for the final project. I illustrated the relationship between discounted orders and profits to show that discounted orders are by far less profitable. 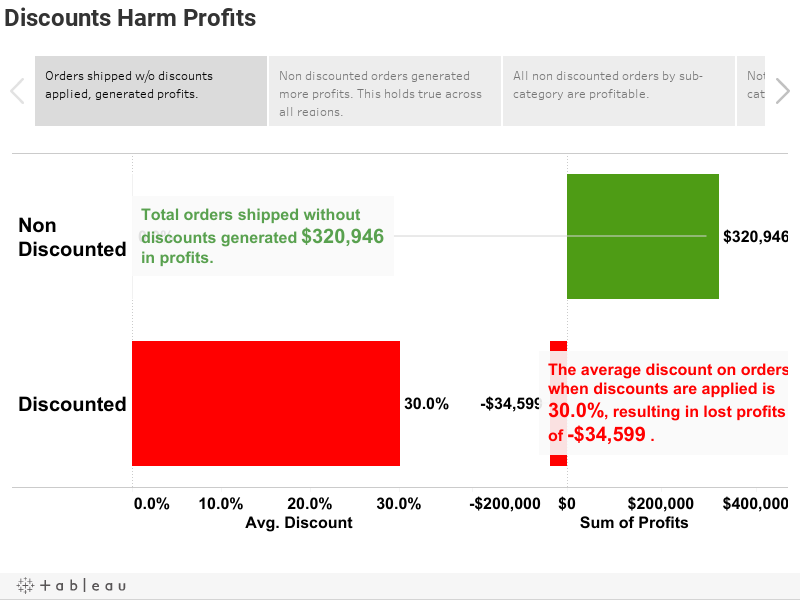 This was accomplished by creating a set in Tableau to identify all discounted orders.